JayeL Audio | Maximo Park: UK "Pleasure"
Home » albums, Indie » Maximo Park: UK "Pleasure"
Our Earthly Pleasures is the sophomore offering from North-East England based Maximo Park. The album celebrates the many aspects of human emotion from a post-punk revival point of view. Lead by front man Paul Smith, the band was more than able in forming a collection that embodies the roller-coaster that is life. “Our Velocity” exploits the band’s strength in creating dance-able tunes no matter the pace. Featuring a synthesizer straight out of the ’80s, the song’s frenzied tempo matches the Smith’s schizophrenic rant about life careening out of control. He sings, “Never, never try to gauge temperature/When you tend to travel at such speed/It’s our velocity.” To further the effect, he implements a yodeling dynamic as guitars and drums jump up and down like a lie detector test. It is like he is trying to combat his new feeling of loneliness in the rat race by arguing with himself. Concluding by repeating “I’ve got no one to call/In the middle of the night anymore/I’m just alone/With my thoughts.” Interesting subject matter for a dance-rock track. “Books From Boxes” also speaks to relationships gone awry, as Smith recounts the signs of a break-up. Looking over each detail of the situation like a detective adding up clues, he explains “We rarely see/Warning signs in the air we breathe/Right now I feel each and every fragment.” The lines are very reflective and point to the way love can make people oblivious or at least ignore the subconscious. The act of “unpacking books from boxes” could be used to describe feelings that were never opened in the failed relationship, as literature the goes unread. 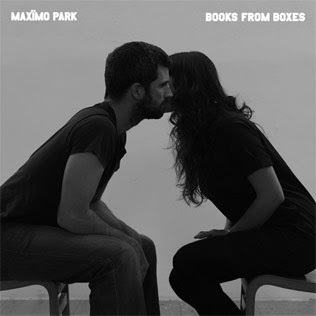 Maximo Park easily avoids the ominous sophomore slump on Our Earthly Pleasures by playing to their strong points: crafting energetic tracks at a variety of paces that are also lyrically reflective.